When my conversation with Dr. Channamsetty began, I learned that she grew up in a household that valued education and helping others. When it came time for Dr. Channamsetty to go to college it only made sense to follow in the footsteps of her father and become a physician. Becoming a physician was something she always knew she wanted to do. Dr. Channamsetty received her medical degree from the American University of the Caribbean and her Family Practice Residency from Central Maine Medical Center. After her residency, Dr. Channamsetty spent her time working for multiple family practices before she ultimately moved to Connecticut. When Dr. Channamsetty arrived in Connecticut her biggest interest was working with the underserved population. She knew she wanted to work for an organization that primarily focused on helping those in need. 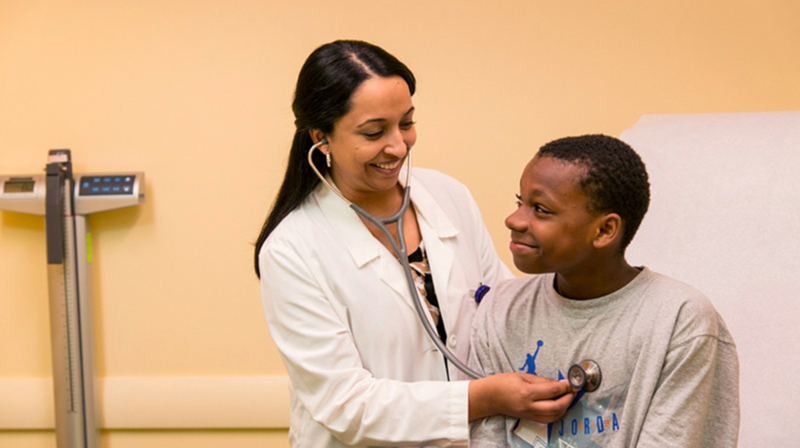 Dr. Channamsetty then began a meaningful career as a primary care physician at CHC Meriden. Over time Dr. Channamsetty saw CHC as a progressive and innovative organization that was always looking for ways to improve, inspiring her to improve her career and role as a primary care physician. After working at CHC for one year, Dr. Channamsetty received the title of On-site Medical Director (OSMD) for the Meriden and Waterbury sites. During her four years as the OSMD she medically managed her full patient panel and directly supervised the Physicians and APRNs both clinically and administratively. Dr. Channamsetty then went on to serve as CHC’s Associate Chief Medical Officer for one year when she then assumed the prestigious role of Chief Medical Officer. Becoming the Chief Medical Officer for CHC has been a big accomplishment for Dr. Channamsetty. She started at CHC as a provider who was able to embed herself into the culture and values of CHC allowing her to better herself as well as the organization. Dr. Channamsetty takes pride in the fact CHC always has, and always will, put its patients first while prioritizing quality improvement for care delivery and for its staff. While Dr. Channamsetty is an extremely busy person, she is currently focused on promoting Interdisciplinary Care Delivery and the Team Based Care Model that is used at CHC. The Team Based Care Model is a model of care that allows the primary care team and other co-located disciplines, such as behavioral health or nutritionists to work together to optimize patient experience by ensuring they receive the best care possible. Because of all of the work Dr. Channamsetty and her colleagues have done around this model within CHC, they had the honor of presenting at the National Association of Community Health Centers (NACHC) Conference. Dr. Channamsetty shared that she is so proud of the providers at CHC and the work they accomplish on a daily basis. From the tone in her voice it is easy to tell Dr. Channamsetty is so enthusiastic and passionate about the work she does within CHC and the community.